Banding—which can bundle or multi-pack products, keep containers closed or even ensure that products remain unitized during manufacturing—enjoys a two-decade history in its modern incarnation, but the best looks yet to come for this time-tested method. Plus, the technique offers even more than those benefits, addressing such up-to-the-minute concerns as energy conservation, material savings and waste reduction. In addition, new enhancements are occurring all the time, making banding a truly state-of-the-art method for enhancing a packaging operation. Banding is a lot of things, but it differs from strapping, though the terms often are erroneously used interchangeably. Strapping is mainly used for shipping or very rugged applications. The hard rigid plastic of strapping can easily dig into a product’s corners, especially in heavy-tension applications. Banding is a true packaging process with different objectives than strapping. For example, banding wouldn’t prove a good choice for sealing/reinforcing a corrugated box destined to be shipped through UPS or FedEx but strapping is. Another major difference between banding and strapping is that banding provides the “zero damage” advantage. The paper or poly film material used in banding is thinner and wider than strapping, permitting the material to draw down around products without inflicting harm. People also sometimes confuse shrink bands with regular banding. Shrink bands need heat to shrink around a product whereas banding does not. Lots of new banding developments are occurring, with constant advances taking place in the ways products can be accepted in production lines. These include: up-stacking, down-stacking, counting, collating and, ultimately, a finished product that is banded. One available machine offers the use of wider material in ultra-sonic banding machines. This machine adds more material coverage on the product, which ranges from 75mm (3-inch) to 100mm (4-inch) wide materials. Wider banding material makes it attractive to brand products such as towels or containers for retail labeling. Banding edges out its main competitor, shrink-wrapping, in several ways, and obtaining an accurate comparison is easily accomplished. The first consideration to explore when comparing the two is to evaluate shrink-wrap’s cost, including the energy involved in running heat tunnels. Once the cost of each package is achieved, simply compare it to the cost of a band. Higher-volume applications tend to move toward automated systems, as they can justify a company’s ROI requirements. One prominent drug manufacturer eliminated the need for an employee in their production line and increased their production rate by switching to banding automation. Consider that printing companies pass on a shrink-wrapping charge of $0.25-$0.35 per package. Most clear banding will do that same bundle for about $0.015 to $0.02 each. This offers a competitive edge and additional profit margins. Comparing the two methods side-by-side offers even more obvious reasons why banding often is the preferred way to go. Unitizing Product: Banding uses easily removed materials, such as paper or clear poly film. Shrink can be difficult to remove and, in most cases, redundant. Redundancy occurs when a bundle of individually shrink-wrapped packages is wrapped together as a unit. This second over-wrap is unnecessary in most cases. Less Material: Banding uses less material coverage. Material widths range from 15mm wide material up to 100mm. By contrast, shrink covers the entire product. Eco-Friendliness: Banding uses less material for waste disposal and far less energy than the energy-devouring heat tunnels needed for shrink-wrapping. Ultra-Sonic Capable For Heat-Sensitive Products/Materials: Ultra-Sonic sealing machines offer consistency, a strong and reliable seal, and allow for unitizing of sensitive products such as food or other “heat-sensitive” products. By comparison, shrink-wrapping with heat tunnels can damage some products. Retail-Ready Labeling/Branding With Banding: Fully pre-printed banding material with complete product branding achieves two functions simultaneously: unitizing and labeling. On-demand UPC, time/date stamps and artwork/logos are available for use when choosing an optional thermal printing system. Easy Opening: Easy opening can be achieved when using paper, by simply tearing it.  With poly films, a simple fine-tuning allows adjustment of welding time of the ultra-sonic sealing head, creating an easy-to-open banded product. Of course, certain situations won’t lend themselves well to banding. Banding would not be appropriate in instances where a product needs to be totally protected. Other times, banding and shrink-wrapping can work together. A good example is CD/DVD cases: Tall bundles are sometimes banded first to keep the product intact, then shrink-wrapped for protection. A conversion to an automated banding system can prove quite beneficial to a company by providing overall labor and material savings. Floor-model machines are available for use with an operator and produce the same finished result—a banded product. The overall cost savings using automation could very well pay for the equipment/investment and justify the cost. The best way to incorporate banding into an existing operation would be to first obtain a proper evaluation by a professional, or when applicable, an in-plant performance demonstration. By using the machine for a trial period, production managers can perform time studies to evaluate production speeds and ensure quality control of the banded product. In most cases, the cost savings can pay for the new machinery. Prior to taking that step, it would be helpful to visit a vendor’s Web site and learn about banding applications and machinery by viewing videos and brochures. Calculating current cost per bundle is important and will help determine ROI requirements. Companies pursuing banding should arrange for samples to be sent to a vendor’s facility for evaluation. Upon completion, the product can be banded and shipped back for review. A banding-equipment vendor should be expected, even required, to provide training, technical support, the availability of consistent and quality material, and a proven track record of reliability.